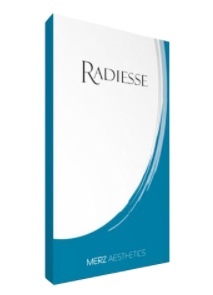 Radiesse is a sterile, latex-free, non-pyrogenic, semi-solid, cohesive subdermal implant. The principle durable component of Radiesse is synthetic calcium hydroxylapatite, a biomaterial with over twenty years of use in orthopedics, neurosurgery, dentistry, otolaryngology and ophthalmology. Nasolabial folds, between the mouth and nose. "Lines of puppets" so-called "smile wrinkles" in the corners of the mouth. Radial lip wrinkles: wrinkles above the upper lip. Cavities of the skin and scars, for example, acne scars. Sunken cheeks caused by atrophy. Nose and chin for correction of dents, bumps. Lower jaw: improving the contours in this area. Hands to reduce the severity of the veins and bones of the hands of aging. Radiesse was approved by the FDA (the American regulatory authority) in 2006. In addition, Radiesse was approved by EU authorities in 2004. It has CE certification which is the European Union standard for product safety. Over 3 million packs have been used by practitioners and patients worldwide making Radiesse one of the most used and reliable products. The V-Effect or V-Lift is the key to restoring a youthful look. With the right product and the right injection technique, the face will regain the optimum 'V' shape, and the wrinkles and sagging will naturally reduce. The V-Effect lift can be achieved with the dermal filler Radiesse. When Radiesse is injected into the skin the gel-matrix of calcium microspheres pushes up the contour depressions, providing an immediate lifting effect and giving instant volume. The calcium microspheres stimulate the production of our own natural collagen, which will further build the volume for prolonged benefit. Individual results are dependent on age, skin type, lifestyle and metabolism and, of course, the area treated. Generally the effect of the treatment lasts around a year for most patients. Restoring shape and volume to the face, filling moderate to deep lines and folds, rejuvenating the back of the hands. In over 70 markets around the world, including major markets in Europe and America. Make an appointment with your practitioner to find out if Radiesse® is right for you.